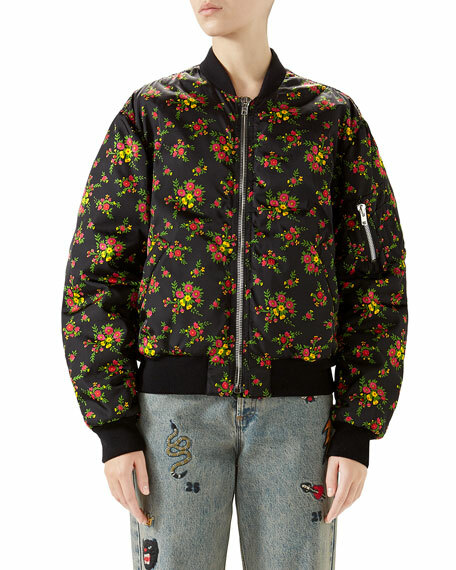 Floral bouquet-print woven gabardine bomber jacket. Ribbed collar, hem, and cuffs. Gucci chevron quilted bomber jacket in metallic lambskin leather. Quilted interlocking G detail at back. Elasticized collar, cuffs, and hem. Gucci chevron quilted bomber jacket in metallic lambskin leather. Quilted interlocking G detail at back. Elasticized collar, cuffs, and hem. Baseball collar; full zip front. Long sleeves. Welt pockets at waist. Lining: polyester. Trim: cupro. Made in Italy. 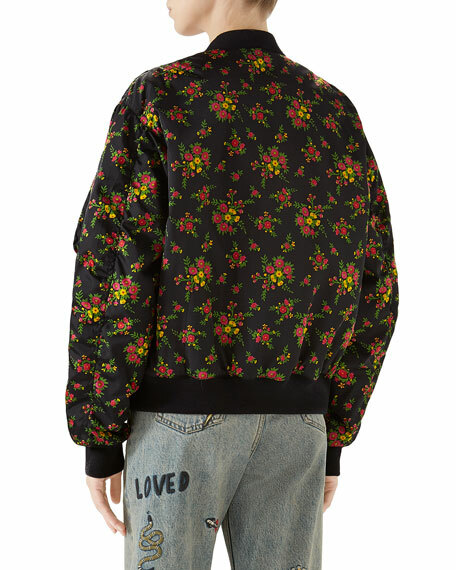 Leaf-brocade lace bomber jacket with embroidered chest patch. Striped ribbed collar, hem, & cuffs. Baseball collar; zip front. Side slip pockets. Relaxed fit. Viscose/cotton/nylon. Combo, silk. Made in Italy. Gucci jacket in checked tweed with contrast trim. Round neckline; feline head metal button front. Long puff sleeves. Four patch pockets. Back pleat detail. Oversize fit. Cotton/acrylic/nylon. Made in Italy.